NEW BRITAIN - The New Britain wrestling team is heading home from the Longmeadow duals with broomsticks in hand. A clean 4-0 sweep in Saturday’s action improved the Hurricanes’ duals record to 19-10 heading into their final dual meet with Southington on Wednesday. 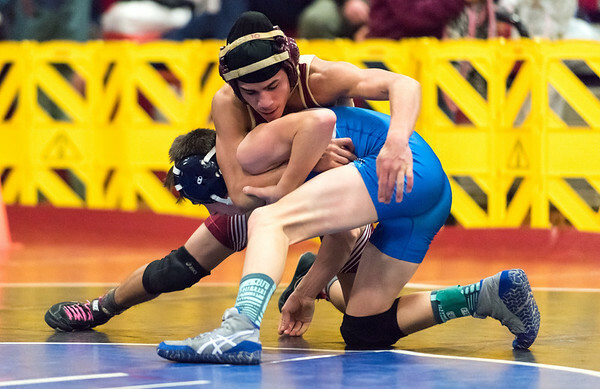 The Hurricanes will be entering that meet with plenty of momentum after finishing Saturday’s action with a victory over CCC North Champion Enfield thanks to a pin from Isahus Maldonado in the final match of the meet to secure the win. The Hurricanes opened the day with a 68-12 victory over Chicopee behind five pins for the Hurricanes, including Angel Maldonado, Elijah Aponte, Elijah Watson, Oran Burnett and Juliano Morales. New Britain followed with another convincing victory, this time a 69-12 win against host Longmeadow, again behind five pins. Pinning for the Hurricanes were Tyree Pinnock, Nickolas Richardson, Isahus Maldonado, Watson and Burnett. The Hurricanes continued to cruise in their third dual, downing Fitch from Groton 54-22 thanks to seven pins. Aponte, Watson, Richardson, Morales and both Maldonados all secured pins once again, while Izaiah Medina also joined the pin party. The Hurricanes faced a tough test in Enfield in their final dual of the day. It was a back and forth affair that came down to the last match, as the Hurricanes were down 35-33 and needing a win to take the dual. Isahus Maldonado picked up the pin to lift the Hurricanes past the Eagles 39-35. Bloomfield 55, New Britain 53: The Hurricanes got a potential game-tying shot off as time expired, but couldn’t get it to fall as Bloomfield escaped with the narrow victory. Maya Slisz kept the Hurricanes fighting until the last possession by dropping a game-high 24 points, while Tianna Sweeney added 10. Three different Bloomfield players finished in double figures, including Jayanna Whitt, who led the team with 13 points. Newington-Berlin 4, Northeastern 0: Newington-Berlin clamped down on defense in its win against Northeastern, holding the Shamrocks to just 15 shots on goal in the shutout victory. Ethan Ranger tallied two goals for Newington-Berlin, with his brother Kilian assisting on his first goal. Sam Hedlund found the back of the net in the third period, while adding an assist on a Matt Lavoie goal in the second period. New Britain 62, Wilbur Cross 59: Clinging to a two-point lead and looking to put the game away, the Hurricanes missed three of their final four foul shots but hung on for a close win at home. At the foul line with less than five seconds left, Thameen Dupree made the front end of a one-and-one but missed the second, but Kaiyon Gunn grabbed the offensive rebound and was intentionally fouled. Gunn missed both free throws, setting up a halfcourt heave by Wilbur Cross at the buzzer that fell short. Shamah Charles led the Hurricanes with 16 points, while Gunn added 10. New Britain outscored Wilbur Cross 19-8 in the third quarter to send the team on its way to its fifth-straight win. New Britain: Kaiyon Guinn 4-0-10, Isaiah Jenkins 2-1-6, Maurice Turner 3-0-7, Thameen Dupree 2-5-9, Nyzaiah Diaz 1-1-3, Luis Cartagena 1-0-2, Bryan Thompson 4-0-9, Shamah Charles 6-4-16. Totals: 23-11-62. Wilbur Cross: Dereyk Grant 2-0-4, Enasj Jones 4-3-12, Kyle Daniels 5-4-15, Darius Esdaile 2-1-5, Terrance Edwards 6-3-15, Tyron Clemens 4-0-8. Totals 23-7-59. Records: New Britain 10-3, Wilbur Cross 10-6. Bloomfield: Amani Levitan 4-1-9, Aliyah Robinson 1-0-2, Jayanna Whitt 4-5-13, Jalisa Turner 4-3-11, Gabby Douglas 4-3-11, Leigh Ann LaBad 4-1-9. Totals: 21-13-55. New Britain: Asia Gaines 1-2-5, Maya Slisz 9-4-24, Raven Symone Jarrett 4-0-8, Adrianna Faienza 0-2-2, Tianna Sweeney 4-4-10, Brianna Clarke 1-2-4. Totals: 19-14-53. Records: New Britain 4-12, Bloomfield 10-5. Goals: Ethan Ranger (N), Matt Lavoie (N), Ethan Ranger (N), Sam Hedlund (N). Saves: Alex DiPaola (N), 15. Derek Leshak (NE), 27. Records: Newington 10-4, Northeastern 3-11. Posted in New Britain Herald, New Britain, Newington on Saturday, 2 February 2019 21:24. Updated: Saturday, 2 February 2019 21:26.